Big Top Rock - Let Us Entertain You! Home What's On Big Top Rock - Let Us Entertain You! 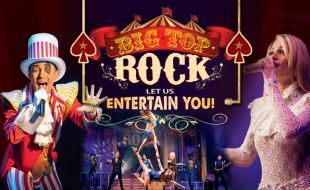 The Barnyard Theatres proudly presents the return of its legendary rock and roll circus show - Big Top Rock; the rock concert with a difference! The Big Top Ringmaster will take you on a musical journey with music from rock groups; Def Leppard, ACDC, Kings of Leon, Aerosmith and Red Hot Chili Peppers to rock and pop icons; Elvis Presley, Pink, Elton John, Michael Jackson, Pitbull and many more. Experience a variety of acts that include pole, acrobatics, silk, trapeze and lyra - all performed to the beat of the rocking live band and singers. The Barnyard Theatre reserves the right to change any shows, dates, Prices, cast members & show content without notice. Tsogo Rewards Members enjoy instant *discount (from 10% off) may not be used in conjunction with other discounts.